Yeah, I really got into Analogue. 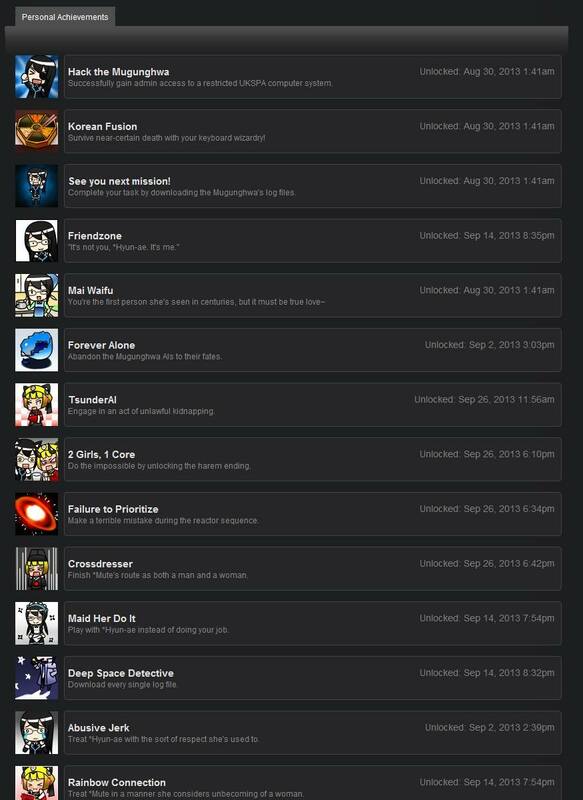 That's all of the achievements. $ cd "Analogue A Hate Story/game"
There’s an obvious file identifier (RPA-3.0), followed by a couple numbers and a lot of compressed-looking data. The first number turns out to be very close to the total file size, so it’s probably some size or offset field, while the other one looks like some kind of signature. At this point I simply referred to the Ren’Py source code, rather than waste time experimenting on the data itself. Turns out the first number is the file offset of the index, and the second one is a key used for simple obfuscation of elements of the index (numbers are bitwise exclusive-or’d with the key). The archive index itself is a DEFLATE-compressed block of pickled Python objects. The index maps file names to tuples of offset and block length specifying where within the archive file the data can be found. With that knowledge in hand, it’s short work to build a decoder for the index data and dump it all to files. This is rpa.py in my tools. Extracting the archives pulls out plenty of images and other media, as well as a number of interesting-looking .rpyb files, which we’ll discuss shortly. For a bit of amusement, I exercised my web-programming chops a little and built a standalone web page for playing with the extracted costumes and expressions of *Hyun-ae and *Mute, which I’ve included below. Here’s a link to the bare page for standalone amusement as well. The basic format of compiled scripts (.rpyb files) is similar to that of resource packages. The entire thing is a tuple of (data, statements), where data is a dictionary of basic metadata and statements is a list of objects representing the script’s code. The statements in this are just the Ren’py abstract syntax tree, so all the objects come from the renpy.ast module. Unfortunately and as I’ll discuss later, the pickle format makes this representation hard to work with. The structure of AST members is designed such that each object can have attached bytecode. In practice this appears to never happen in archives. In my investigations of the source, it appears that Ren’py only writes Python bytecode as a performance enhancement, and most of it ends up in bytecode.rpyb. That file appears to provide some sort of bytecode cache that overrides script files in certain situations. For the purposes of reverse-engineering this is fortunate– Python bytecode is documented, but rather more difficult to translate into something human-readable than the source code that is actually present in RPYB archives. ## <class 'renpy.ast.Show'> -- don't know how to dump this! ## <class 'renpy.ast.Say'> -- don't know how to dump this! ## <class 'renpy.ast.Jump'> -- don't know how to dump this! ## <class 'renpy.ast.With'> -- don't know how to dump this! Clearly there are a few things my decompiler needs to learn about. It does, however, handle the more common block elements such as If statements. In any case, the Python code embedded in these scripts tends to be more interesting than the rest (which are mostly just dialogue and display manipulation) for the purposes of reverse-engineering. If you’re more interested in spoiling the game for yourself, it’s not as useful. config.window_title = u"Analogue: A Hate Story"
The spacing here is interesting; I suspect (but haven’t attempted to verify) that the Ren’py script compiler strips comments since there haven’t been any in all of the scripts I’ve examined, so it’s likely that the unusual empty blocks in the code were comment blocks in a former life. I’ve yet to dig much into what determines when demo_mode is set, but I doubt it would be difficult to forcibly set (or clear) if one were so inclined. Not that I condone such an action..
You can get some idea of how specialized Ren’py’s execution environment is from this code. Particularly, store is a magic value injected into the locals of Python script blocks which maps to the RPY persistent variable store, which stores most of the game state. config is a similar magic value providing a handle to the engine configuration. In this instance, radiation refers to a sort of hidden timer which forces the player to solve a puzzle on expiration (assuming the preconditions have been met), then make a decision which causes the plot to fork depending on that decision. Elsewhere in the code, I found a few developer switches which allow one to display the value of this countdown and reset or force it. As the official documentation notes, the process of resource compilation is not very secure but is enough to deter casual copying. I’ve shown here that such a claim is entirely correct, though script decompilation may be somewhat harder than the developers envisioned due to the choice of pickle as a serialization format. It’s nothing particularly new to me, but a reminder to designers of software: if it runs on your attacker’s system, it can be hacked. It’s not a question of “if”, but instead “how fast”. I was mostly interested in extracting resources with this project, which was quite easy. In that matter, I think the designers of Ren’Py made a good design decision. The compiled archives and scripts are much more robust against accidental modification in the face of curious users than not compiling anything, but the developers do not expend undue effort building something harder to break which would eventually be broken anyway by a sufficiently determined attacker. As I alluded to earlier, the pickle representation makes the Ren’Py AST hard to work with. This is because many of the objects contain references to the engine state, which in turn implies most of the engine needs to be initialized when unpickling the AST. To say the least, this is not easy- engine initialization is not easily separated from game startup. To illustrate the problem, observe that the Ren’Py developer kit is simply the engine itself packaged with a game of sorts that provides help in getting a new project set up by modifying the included scripts. There simply seems to be no part of the engine that is designed to run without the rest of it running as well. In experimenting with different products built with Ren’Py, I’ve had to make changes to some combination of the engine itself and my code in order to bootstrap the engine state to a point where the AST can be successfully unpickled. Suffice to say, this has hampered my progress somewhat, and led me to consider slightly different avenues of attack. The most promising of these would involve a semi-custom unpickler which avoids instantiating actual Ren’Py objects; the only data that need be preserved is the structural information, rather than the many hooks into engine state that are also included in the pickle serialization. 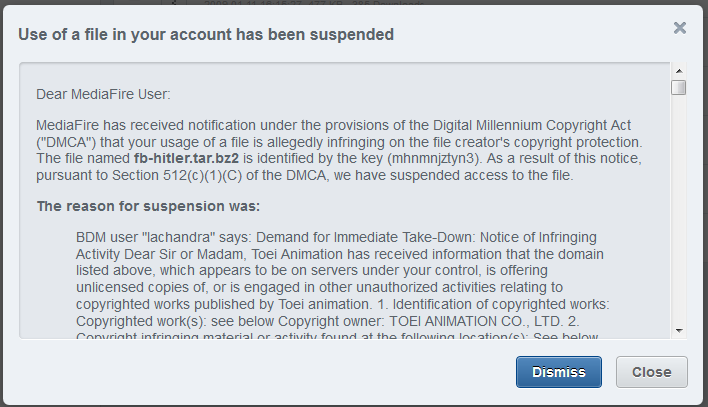 Further continuation of this project is likely to take this approach to deserialization. I’ve been working on a project that uses GStreamer to play back audio files in an automatically-determined order. My implementation uses a playbin, which is nice and easy to use. I had some issues getting it to continue playback on reaching the end of a file, though. This signal is emitted when the current uri is about to finish. You can set the uri and suburi to make sure that playback continues. This signal is emitted from the context of a GStreamer streaming thread. Because I wanted to avoid blocking a streaming thread under the theory that doing so might interrupt playback (the logic in determining what to play next hits external resources so may take some time), my program simply forwarded that message out to be handled in the application’s main thread by posting a message to the pipeline’s bus. Now, this approach appeared to work, except it didn’t start playing the next URI, and the pipeline never changed state- it was simply wedged. Turns out that you must assign to the uri property from the same thread, otherwise it doesn’t do anything. Fortunately, it turns out that blocking that streaming thread while waiting for data isn’t an issue (determined by experiment by simply blocking the thread for a while before setting the uri). See also: the original mailing list announcement of the mirror’s availability. Nich (one of my roommates) mentioned recently that discussion in his computer networking course this semester turned to IPv6 in a recent session, and we spent a short while coming up with interesting ways to consider the size of the IPv6 address pool. Assuming 2^128 available addresses (an overestimate since some number of them are reserved for certain uses and are not publicly routable), for example, there are more IPv6 addresses than there are (estimated) grains of sand on Earth by a factor of approximately 3 × 10^14 (Wolfram|Alpha says there are between 10^20 and 10^24 grains of sand on Earth). While Nich quickly lost interest in this diversion into math, I started venturing into cosmic scales to find numbers that compare to that very large address space. I eventually started attempting to do things with the total mass of the Solar System, at which point I made the connection to a Matrioshka brain. “A what?” you might say. A Matrioshka brain is a megastructure composed of multiple nested Dyson spheres, themselves megastructures of orbiting solar-power satellites in density sufficient to capture most of a star’s energy output. A Matrioshka brain uses the captured energy to power computation at an incredible scale, probably to run an uploaded version of something evolved from contemporary civilization (compared to a more classical use of powering a laser death ray or something). Random note: a civilization capable of building a Dyson sphere would be at least Type II on the Kardashev scale. I find Charlie Stross’ novel Accelerando to be a particularly vivid example, beginning in a recognizable near-future sort of setting and eventually progressing into a Matrioshka brain-based civilization. While the typical depiction of a Dyson sphere is a solid shell, it’s much more practical to build a swam of individual devices that together form a sort of soft shell, and this is how it’s approached in Accelerando, where the Solar System’s non-Solar mass is converted into “computronium”, effectively a Dyson swarm of processors with integrated thermal generators. By receiving energy from the sunward side and radiating waste heat to the next layer out, computation may be performed. Okay, we’ve gotten definitions out of the way. Now, what I was actually pondering: how does the number of routable IPv6 addresses compare to an estimate of the number of computing devices there might be in a Matrioshka brain? That is, would IPv6 be sufficient as a routing protocol for such a network, and how many devices might that be? A silicon wafer used for manufacturing electronics, looking into the near future, has a diameter of 450 millimeters and thickness of 925 micrometers (450mm wafers are not yet common, but mass-production processes for this size are being developed as the next standard). These wafers are effectively pure crystals of elemental (that is, monocrystalline) silicon, which are processed to become semiconductor integrated circuits. Our first target, then, will be to determine the mass of an ideal 450mm wafer. Now, this diagram is rather difficult to make sense of, and I struggled with a way to estimate the number of atoms in a given volume from that. A little more searching revealed a handy reference in a materials science textbook, however. The example I’ve linked here notes that there are 8 atoms per unit cell, which puts us in a useful position for further computation. Given that, the only remaining question is how large each unit cell is. That turns out to be provided by the crystal’s lattice constant. 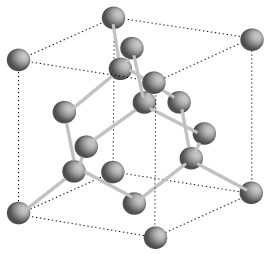 According to the above reference, and supported by the same information from the ever-useful HyperPhysics, the lattice constant of silicon is 0.543 nanometers. With this knowledge in hand, we can compute the average volume per atom in a silicon crystal, since the crystal structure fits 8 atoms into a cube with sides 0.543 nanometers long. Now that we know the amount of space each atom (on average) takes up in this crystal, we can use the atomic mass of silicon to compute the density. Silicon’s atomic mass is 28.0855 atomic mass units, or about 4.66371 × 10^-23 grams. Thus, we can easily compute the mass of a single wafer, given the volume we computed earlier. Left: plan view of a small part of a doped semiconductor substrate. Right: cross-sectional view of same. Images by Chipworks. There’s also a question of the undesired impurities, but those concentrations should be even less important to our case. If we refer to some (slightly old) figures on the tolerances of a commercial wafer, well.. I’m not entirely sure how to make sense of those numbers. We can consider that the magnitude of undesired impurities in the wafer must be significantly less than that of the intentional ones (since that would affect the semiconductor properties in a hard-to-control fashion), however, and decide it’s not worth worrying about. If you look around that tolerance sheet though, you can get a good idea of how exact the mechanical specifications are. For example, local deviations in the surface must be less than 0.25 micrometers (although it doesn’t appear to include a definition for “local flatness”, rather disappointingly). Interconnect stacks of metal and insulator layers on two common types of integrated circuits. How does this metal stack compare to the wafer’s thickness? 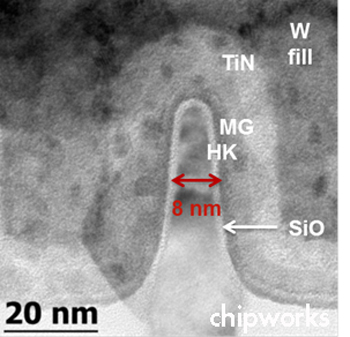 Chipworks don’t publish many cross-sectional images like the one above, but here’s one of the same Intel 22 nanometer process featured on the left side of the above image, this time with scale bars (and much higher magnification). 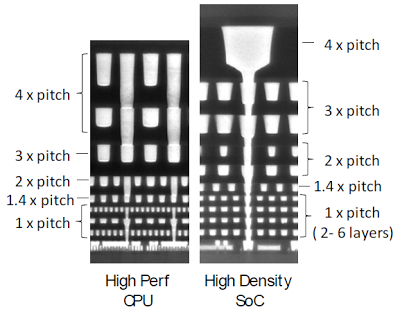 A PMOS FET on Intel's 22 nanometer process. But enough of things that don’t enter into our computations. Back to the real work! To this point, we’ve computed the density of monocrystalline silicon and determined the volume of a 450mm silicon wafer. Next, we should determine how many useful computing devices can be obtained from a single wafer. As a possible model for a hypothetical processor to drive a computronium Dyson swarm, I’ll refer to Texas Instruments’ MSP430 microcontrollers. These devices include an efficient CPU core with a number of analog peripherals on-chip. The analog consideration is important, because some way for the members of our Dyson swarm to communicate is required. In this situation, I’ll assume some sort of radio is on the same die (the piece of a silicon wafer that makes up a single chip) as the CPU, allowing two-way communication with nearby processors. In addition, power generation components (since these devices must gather energy from the sun independently) will likely be at least partially analog. This assumption of radio communication is perhaps not accurate, since optical communication may be much easier to control in such a dense network, with optical emitters (LEDs or laser diodes, probably) and receivers (photodiodes) constructed directly on the wafer. For this case, however, it’s not terribly important, since space taken by unneeded analog parts on the real-world MSP430 could easily be reused, for example to provide additional on-chip memory. With a model chip to refer to, we must now determine the size of an MSP430’s die. The smallest package (integrated circuits are usually sold encased in epoxy packages with exposed metal pads to make electrical connections to) any MSP430 is available in (that I can quickly find) appears to be a chip-scale BGA, on the MSP430F2370 (I’m providing a copy of the datasheet here, as well). This is perfect for die size estimation, since we can assume that the chip-scale BGA package (YFF in TI’s parlance) is essentially the same size as the die. This estimate is supported by a note on the package drawing (note D) that the exact package size of a device is specified in the device-specific datasheet. TI's YFF (R-XBGA-N49) 49-pin chip-scale BGA package, planar drawing. Since the note indicates actual package dimensions are determined by the device contained therein, I believe it is safe to assume that the device package is approximately the same size as the die. 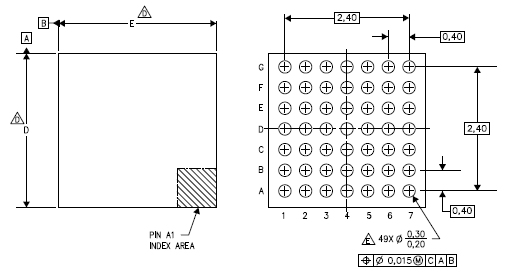 Referring to the Device Pinout section of our datasheet, Table 2 (on page 4) provides the overall package dimensions: 3.2 ± 0.05 millimeters on each side. Now we must determine the number of dies that can be made from a single wafer. This turns into a geometric packing problem where we want to fit as many squares (dies) as possible into a circle (the wafer), which is surprisingly hard. I found an interesting collection of records for some number of squares packed into the smallest circle, but, there’s no simple way to determine an optimal packing. Wolfram|Alpha has some capability to estimate properties of such an optimal packing, and it says we could get 15279 dies out of a 450mm wafer, with 98.37% efficiency. But wait! We’re assuming somewhat more advanced manufacturing than is currently available. Certainly, I’d expect a computronium manufacturing effort with intent to convert the entire Solar System to recycle waste materials whenever possible, so per-wafer waste isn’t really a concern, since the portions of the wafer that cannot be made into usable dies can simply be recycled into new wafers. Thus, a simple area calculation can be used to determine the amortized number of dies yielded from each wafer. Now it’s time to determine how many processors we could get by converting the entire non-Solar mass of the Solar System into integrated circuits. We will assume a way exists to efficiently form the requisite materials out of what may be available, likely via nuclear fusion (particularly for converting the mostly-hydrogen gas giants into silicon). The mass of the Solar System excluding the Sun, Jupiter and Saturn can be determined by adding together all the calculated masses for its largest objects and using rough calculations for the masses of the Oort cloud (estimated at roughly 3 Earth masses), the Kuiper belt (estimated at roughly 0.1 Earth mass) and the asteroid belt (estimated to be 0.0005 Earth mass) for a total, rounded upwards, of ~37 Earth masses, or 8.1 percent the mass in orbit around the Sun. With the combined masses of Uranus and Neptune (~31 Earth masses) subtracted, the remaining ~6 Earth masses of material comprise 1.3 percent of the total. Having done all the physical computations, we finally have a sense of how a Matrioshka brain could use IPv6. We can make about 10^32 processors out of the Solar System, compared to about 10^38 (theoretically) available IPv6 addresses. That is, it would take approximately one million Matrioshka brains to completely exhaust the IPv6 address pool. In practice, such a dense network would not be desirable, since the very large IPv6 address space allows a lot of slack in address allocation to make routing easier. For example, clearly-defined hierarchical address allocations allow routers to efficiently determine destinations for traffic via route aggregation or other methods. Basically: once networks shift to IPv6, address exhaustion is not a concern for any forseeable future. The IPv6 address pool could support Matrioshka brains around about 1% of the stars in our galaxy (extimating about 2 × 10^11 stars in the galaxy) all in a single network. Without superluminal communication, such a network would pose its own challenges (mainly in message latency), to the point where I believe it would make more sense to have interstellar communications running on a different network that happens to be bridged with a local IP network. I had a bit of difficulty remembering which novels I was thinking of, but Charlie Stross’ “Singularity Sky” and “Iron Sunrise” and Vernor Vinge’s “A Fire Upon the Deep” involve interesting cases where sublight shipping of information remains relevant in galactic civilizations, representing cases where (non-transcended) civilizations maintain local networks with dedicated (comparatively high-cost) links for long-range communication. I think that is a logical way to approach the problem of networking a galactic civilization, given any expected means of interstellar communication will have limited bandwidth, high latency, or both. So what’s my conclusion? Don’t worry about IPv6 exhaustion. Even if address allocation seems extremely inefficient, since they can (in theory) be reallocated if necessary, and even extremely inefficient allocation still allows a transcended Solar civilization to function comfortably on top of an IP network. Wow, that was a lot of writing. Over about a week, I spent four evenings actively writing this post, for a total of approximately 10 hours. I wrote the math markup in this post with the Interactive LaTeX Editor, which is a really slick tool and allows me to ensure MathJax (which I use to render math markup on the site and is itself magical) will handle the expressions as expected. Highly recommended! Anybody who finds the very lowest level of technology to be interesting (as I do) would probably do well to follow the Chipworks blogs. They also publish teardowns of consumer goods, if that’s more your thing. I liked the joke and am familiar enough with the math of working in unusual bases that I felt a need to implement a quick version of this in Python. Code follows. """Attempts to find a fourier version of x, working down from base b. This is Python 3.x code, using explicit integer division. It should work under the 2.x series if you change line 34 to use “/=” rather than “//=”. It can only go up to base 36, because I didn’t want to deal with bases that are hard to represent in reasonable ways. Up to base 64 is an option, but in that case I would have wanted to use MIME base 64, which puts digits at positions 52 through 61, which would be confusing to read. Thus it only supports up to base 36, but could be adjusted with relative east to do larger bases. A few quirks: it prefers lower bases, so bases that match earlier attempts in fouriness will be printed, despite having equal fouriness. I’ve decided to call values that have no representations containing a ‘4’ character “four-prime”, which is probably going to be a rare occurrence, but the program handles it okay. Generalization of the algorithm is certainly possible, and basically requires changing the condition on line 14 to match different digit values. For example, a hypothetical “Three”ier transform would replace the ‘4’ on line 14 with a ‘3’. I was studying in Japan last semester (which explains somewhat why I haven’t posted anything interesting here in a while). That’s a whole different set of things to blog about, which I’ll get to at some point with any luck (maybe I’ll just force myself to write one post per day for a bit, even though these things tend to take at least a few hours to write..). At any rate, back in Houghton I live with a few roommates in an apartment served by Charter internet service (which I believe is currently DOCSIS2). The performance tends to be quite good (it seems that the numbers that they quote for service speeds are guaranteed minimums, unlike most other ISPs), but I like to have complete control over my firewall and routing. In the past, such freedom has been achieved through my trusty WRT54GL, but the 4-megabyte Flash chip in that device makes it hard to fit in a configuration that includes IPv6 support, which is increasingly important to me. As I had an Intel Atom-based board sitting around some time ago, I decided to turn that into a full-time router/firewall running pfSense. The power available with pfSense is probably overkill for my needs, but it ensures I’ll be able to stay up to date and potentially do fancy things with my network configuration at some future date. Returning to the matter at hand: the whole system was working just fine for a while, but I got a report from my roommates that the internet connection had stopped working, but came up okay with a bargain-basement consumer router (a Linksys/Cisco E900). From what information I was able to get from my roommates, it sounded like a hardware failure in the secondary network card, which is used for the WAN uplink (not exactly surprising, since it’s a 100-megabit PCI Ethernet card I pulled out of something else some time ago). On my recent return to the apartment, one of my priorities was getting the pfSense system up and running again as the main router/firewall. While the E900 was performing fine, pfSense allows me to get a few additional things out of the connection. Most notably, Charter provide a 6rd relay for ISP-provided IPv6 (compared to something like the public IPv6 tunnel service available from Hurricane Electric), which is quite desirable to me. After performing a basic test, the pfSense box did indeed fail to get a public IP address from Charter when put in place as the primary gateway. At that point, I decided to break out a network analyzer (Wireshark in this case) and see how the DHCP solicitations on the WAN interface differed between the E900 and my pfSense configuration. What follows is Wireshark’s dissection of a single DHCP Discover message from each system. There are a few differences there, none of which seem really harmful. Given it was working without incident before, however, I guessed that maybe some upstream configuration had changed and become buggy. In particular, I thought that either the BOOTP broadcast flag (line 32 of both packet dissections) needed to be set for some reason, or the upstream DHCP server was choking on some of the parameters pfSense was requesting. This yielded packets that, when examined in Wireshark, only differed by some of the hardware addresses and the BOOTP broadcast flag. At that point I was rather stuck. Newer releases of dhclient support an option to force the broadcast flag in requests, but FreeBSD (which pfSense is derived from) does not provide a new enough version to have that option, and I didn’t want to try building it myself. In addition, I know that my ISP doesn’t lock connections to MAC addresses, so I shouldn’t have to spoof the MAC address of the E900 (indeed, nothing needed to be changed when switching from pfSense to the E900, so the other direction shouldn’t need anything special). I had spent a few evenings working on the problem, and the fix was that simple. I was glad it was finally working so I could reconfigure internet-y goodness (QoS, DDNS updating, 6rd tunneling, VPN) on it, but there was certainly also frustration mixed in there. So what’s the lesson? I suppose we might say that “you’re never too knowledgeable to try rebooting it”. It’s common advice to less savvy users to “try rebooting it”, but I think that’s an oft-neglected solution when more technically-inclined individuals are working on a problem. On the other hand, maybe I’ve just learned some details about DOCSIS systems and the solution in this case happened to be rebooting. I was reading up on web frameworks available when programming in Haskell earlier today, and I liked the use of domain-specific languages (DSLs) within frameworks such as the routing syntax in Yesod. Compared to how routes are specified in Django (as a similar example that I’m already familiar with), the DSL is both easier to read (because it doesn’t need to be valid code in the hosting language) and faster (since it ends up getting compiled into the application as properly executable code). A pattern I find myself using rather often in Python projects is to have a small module (usually called config) that encapsulates an INI-style configuration file. It feels like an ugly solution though, since it generally just exports a ConfigParser instance. Combined with consideration of DSLs in Haskell, that got me thinking: what if there were an easier way that made INI configuration files act like Python source such that they could just be imported and have the contents of the file exposed as simple Python types (thus hiding some unnecessary complexity)? I was aware of Python’s import hook mechanisms, so I figured that it should be a good way to approach this problem, and it ended up being a good excuse to learn more about the import hook mechanism. Thus, the following code provides a way to expose INI-style configuration as Python modules. It should be compatible with Python 3 after changing the import of ConfigParser on line 1 to configparser, but I only tested it on Python 2.7. # so we need a dummy package. """Load ini-style file ``f`` into module ``m``.""" """Install the ini import hook for the given virtual package name.""" Most of this code should be fairly easy to follow. The magic of the import hook itself is all in the INILoader class, and exactly how that works is specified in PEP 302. So how do you use this? Basically, you must simply run init(), then any imports from the specified package (config by default) will be resolved from an .ini file rather than an actual Python module. Sections in a file are exposed as dictionaries under the module. The ability to reload this module is particularly handy, because my normal configuration module approach doesn’t provide an easy way to reload the file. Some addition improvements come to mind if I were to release this experiment as production-quality code. Notably, additional path manipulations for finding .ini files would be useful, such as taking a path argument to init(), supplying a set of directories to search within. Having a way to remove the import hook that it installs would also be good, and straightforward to implement. There’s no way to get all the sections in the module, so it would also be useful to export the sections somehow– perhaps by having the module support the mapping protocol (so all the sections could be retrieved with module.items(), for example). The main limitation of this scheme is that it has no way to determine the desired type of loaded configuration values, so everything is a string. This is a typical limitation when using the ConfigParser module, but compared to a more robust configuration scheme such as defining objects in a Python file (such as Django does), this might be an annoying loss of expressiveness. The values can always be coerced to the required type when retrieving them, but that’s a bit of unnecessary extra code in whatever uses the configuration. It may also be useful to provide a way to write configuration back to a file when modifying a config module, but my simplistic implementation makes no attempt at such. Doing so would not be terribly difficult, just involving some wrapper objects to handle member assignment for sections and items, then providing a mechanism for saving the current values back to the original file. This made for an interesting experiment, and it should be a handy example for how to implement import hooks in Python. You may use this code freely within your own work, but I’d appreciate if you leave a note here that it was useful, and link back to this post. I caught on to a promotion from AVNet last week, in which one may get a free MAX5214 eval board (available through August 31), so hopped on it because really, why wouldn’t I turn down free hardware? I promptly forgot about it until today, when a box arrived from AVNet. 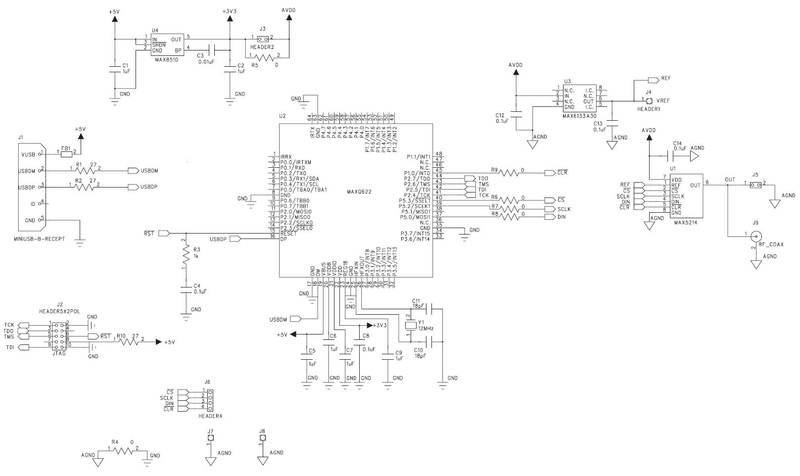 MAX8510- small low-power LDO. Not terribly interesting. MAXQ622- 16-bit microcontroller with USB. I didn’t even know Maxim make microcontrollers! 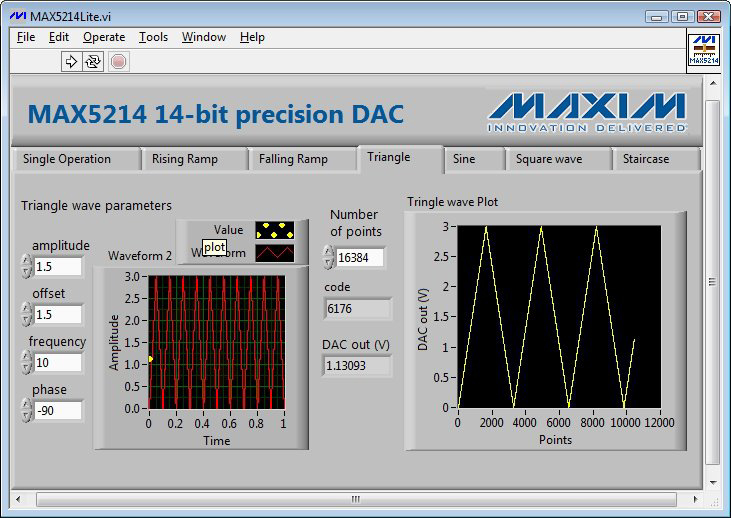 MAX5214- 14-bit SPI DAC. The most interesting part. 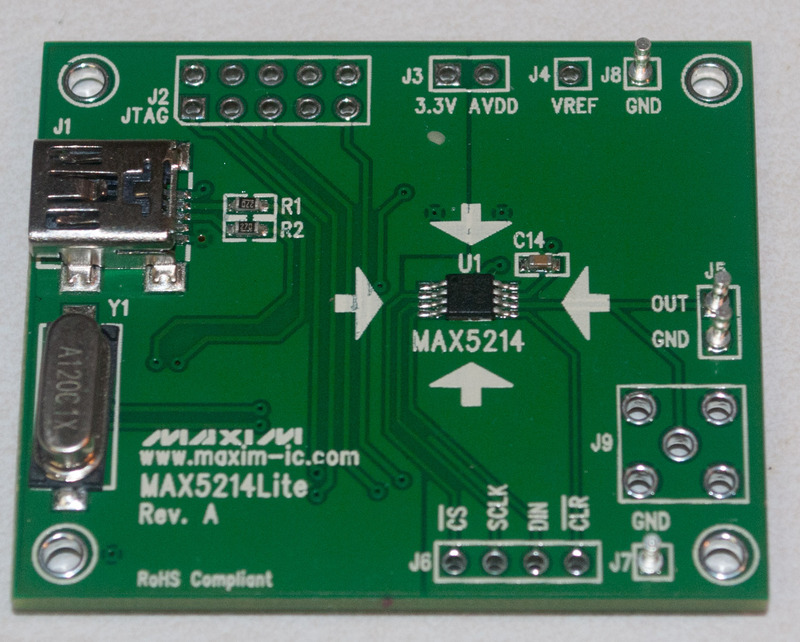 The MAXQ622 micro (U2) is connected to a USB mini-B port for data, and USB also supplies power for the 5V rail. The MAX8510 (U4) supplies power for the microcontroller and also the MAX6133 (U3). 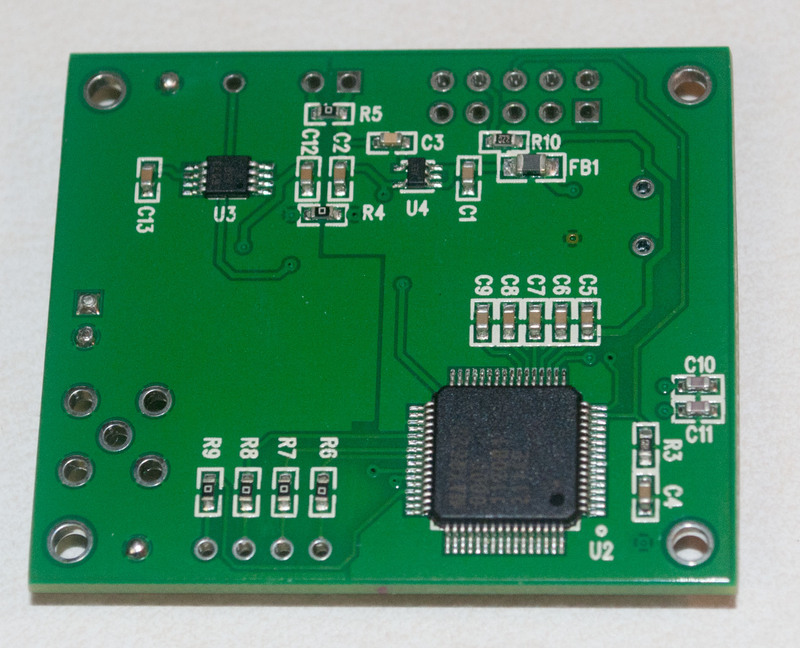 The microcontroller acts as a USB bridge to the MAX5214 DAC (U1), which it communicates with over SPI. The SPI signals are also broken out to a 4-pin header (J6). The software included with the board is fairly straightforward, providing a small variety of waveforms that can be generated. It’s best demonstrated photographically, as below. Those familiar with National Instruments’ LabView environment will probably recognize that this interface is actually just a LabView VI (Virtual Instrument). Rather more interesting than the stock software is the possibility of reprogramming the microcontroller. Looking at the board photos, we can see that there’s a header that breaks out the JTAG signals. With the right tools, it shouldn’t be very difficult to write a custom firmware to open up a communication protocol to the device (perhaps change its device class to a USB CDC for easier interfacing). Reprogramming the device requires some sort of JTAG adapter, but I can probably make a Bus Pirate do the job. With some custom software, this could become a handy little function generator- its precision is good and it has a handy USB connection. On the downside, the slew rate on the DAC is not anything special (0.5V/µs, -3dB bandwidth is 100 kHz), and its output current rating is pretty pathetic (5 mA typical). With a unity-gain amplifier on the output though, it could easily drive decent loads and act as a handy low-cost waveform generator. Let’s get hacking?